By the end of World War II, strategists in Washington and London looked ahead to a new era in which the United States shouldered global responsibilities and Britain concentrated its regional interests more narrowly. The two powers also viewed the Muslim world through very different lenses. 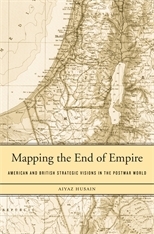 Mapping the End of Empire reveals how Anglo–American perceptions of geography shaped postcolonial futures from the Middle East to South Asia. Aiyaz Husain shows that American and British postwar strategy drew on popular notions of geography as well as academic and military knowledge. Once codified in maps and memoranda, these perspectives became foundations of foreign policy. In South Asia, American officials envisioned an independent Pakistan blocking Soviet influence, an objective that outweighed other considerations in the contested Kashmir region. Shoring up Pakistan meshed perfectly with British hopes for a quiescent Indian subcontinent once partition became inevitable. But serious differences with Britain arose over America’s support for the new state of Israel. Viewing the Mediterranean as a European lake of sorts, U.S. officials—even in parts of the State Department—linked Palestine with Europe, deeming it a perfectly logical destination for Jewish refugees. But British strategists feared that the installation of a Jewish state in Palestine could incite Muslim ire from one corner of the Islamic world to the other. As Husain makes clear, these perspectives also influenced the Dumbarton Oaks Conference and blueprints for the UN Security Council and shaped French and Dutch colonial fortunes in the Levant and the East Indies.